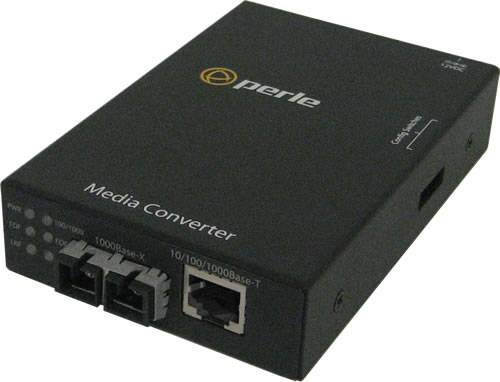 S-1110-M2SC05-XT - 10/100/1000 Gigabit Ethernet Stand-Alone Industrial Temperature Media Rate Converter. 10/100/1000BASE-T (RJ-45) [100 m/328 ft.] to 1000BASE-SX 850nm multimode (SC) [550 m/1804 ft.]. Extended Temperature, terminal block power connector for external power source. S-1110-M2SC05-XT Industrial Temperature 10/100/1000Base Media and Rate Converter. 10/100/1000BASE-T (RJ-45) [100 m/328 ft.] to 1000BASE-SX 850nm multimode (SC) [550 m/1804 ft.]. Extended Temperature, terminal block power connector for external power source. For complete product details and technical specifications, please visit our S-1110-XT 10/100/1000Base-T Industrial Temperature Media Converter Product Page.